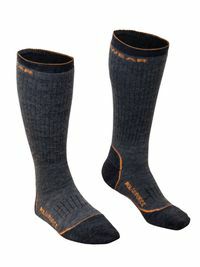 Moisture-wicking socks are a must for anyone working in boots for long stretches of time. In addition to keeping your feet warm and dry while you work, they can also help prevent painful blisters, control foot odor and keep you comfortable all day. They go a long way in keeping you on your feet at work, but have you ever wondered how your moisture-wicking socks work? We all know that clammy feet in your boots makes for a miserable day. This happens when moisture can’t escape your feet, PolarForce Socks allowing moisture to build up inside your boot. Moisture-wicking socks are designed to promote evaporation by allowing the moisture to travel along the fabric rather than be absorbed. Some fabrics are better for wicking away moisture than others, as we’ll get to later. If you’ve ever purchased moisture-wicking socks and found that they didn’t keep your feet as dry as you wanted, this is probably because the sweat had nowhere to go after it traveled along the sock. That’s why purchasing cold weather footwear with moisture management technologies is essential—it means extra warmth, comfort and protection. When it comes to their moisture-wicking capabilities, not all fabrics are created equal. Cotton is terrible at keeping you dry. It’s called a “water-loving” fabric because its molecules are attracted to the opposite molecules in water. That’s why cotton is great for bath towels, but terrible for socks. Merino wool is at the other end of the spectrum and is a “water fearing” fabric. That means it repels water rather than absorb it. Merino wool also has antibacterial properties, making it an effective sock material for fighting bacteria that cause odor. What Are the Best Fabrics for Moisture-Wicking Socks? Given what you’ve just read, you’re probably about to rush out to buy 100% Merino wool socks. Well, not so fast. If you are searching for a work sock, you probably need a blend of materials. Merino wool may be a coveted fabric for moisture wicking, but it doesn’t stretch very well and doesn’t last as long as other fabrics. This is why many moisture-wicking socks contain a blend of both natural and synthetic fabrics to boost their performance. Merino Wool—A top choice for many, Merino wool has antimicrobial properties and is extremely good at providing insulation in cold climates. Synthetics—Nylon and Lycra spandex can provide a snug fit and arch support while keeping feet dry. Acrylic—A synthetic fabric and popular wool alternative, acrylic socks boast both moisture-wicking and odor-fighting properties. Ingeo—An eco-friendly alternative to polyester, this corn-based polylactic acid is often added to cotton and wool. Silk—Silk is a natural fiber with a smooth texture. It’s not durable or practical to use on its own, but this natural insulator is occasionally used in liner socks. Although the type of fabric in moisture-wicking socks plays a huge role in their ability to wick away moisture, it’s not the only thing that can affect their capabilities. For example, some people have health issues such as hyperhidrosis, or excess sweating of the feet. Even with a quality pair of socks, this can make keeping feet dry and comfortable a significant challenge. Other things that can affect moisture-wicking capabilities include your activity level, boot style and how the sock is knitted together. For the best moisture-wicking socks, look for additional features such as ventilation channels and mesh construction that enhance their breathability. Buying cheap socks is one of the worst decisions you can make for your feet. If you want to avoid the inevitable blisters and chafe, skip the department store socks and invest in a quality pair of moisture-wicking socks from RefrigiWear. Designed for cold environments, our moisture-wicking socks will help keep feet warm, dry and comfortable. Whether you need the perfect boot sock that breathes and insulates or moisture-wicking Merino wool socks for sub-zero temps, you won’t regret giving your feet some TLC.